Home Brands Is the Best Coffee Grinder a Blade or Burr? Sure, an automatic coffee maker has its perks. But, there's nothing better than using the best coffee grinder at home. Grinding coffee beans to the perfect consistency produces that aroma coffee aficionados love. It results in a much better tasting cup of Joe to get you going in the morning too. Coffee enthusiasts can easily tell the difference in freshly brewed and store-bought ground coffee. If you want to experience home brewing, you're going to need a quality coffee grinder. Of course, with a quick Google search, you'll find hundreds of machines to select. Ceramic vs. steel, burr or blade, commercial or residential, are some questions you'll encounter in your search. No matter what your level of bean knowledge, you'll look at coffee differently once you taste fresh ground beans. You'll think about, experience, and drink coffee in an entirely different way after investing in a coffee grinder. Over time, it's cheaper than going to a local coffee shop each morning for a freshly brewed cup of coffee. There are numerous benefits for those who drink coffee regularly. That's especially true in cases where people drink two to three cups a day. The cost adds up quickly of buying an espresso at a coffee shop multiple times a week. Owning a coffee maker allows owners to make their favorite drinks at home, and recreate their favorite classic tastes. When comparing coffee makers, there are several varieties to pick. Design, quality, material, and price, are some factors to consider when choosing a coffee grinder. Then there's the decision between a blade and burr system that consumers will make when selecting the best coffee grinder. For those who are ready to buy the best coffee grinder, the first thing to decide is whether to choose a blade or burr system. A blade grinder uses blades to slice the coffee beans. With these systems, owners can control the grind size and consistency with proper timing. The longer they grind the bean, the finer it becomes. This system is more affordable and great for beginners. A burr system features two parts. One stays still, and the other part has a moving motor. The burr crushes, instead of grinding the beans. Better precision is possible with a burr system; however, they are larger, heavier, and more expensive than blade grinders. In this comparison, consumers should also consider whether to choose steel or ceramic coffee grinder. Additionally, they'll want to compare flat vs. conical coffee grinders. Surprisingly to some, flat and conical coffee grinders function similarly. A flat burr features two parallel rings with a space between them. Further, this design allows the coffee beans to fall through that space. A conical burr has a cone ring that grinds the beans to the perfect size. When it comes to steel vs. ceramic, steel burrs are more affordable. They don't last as long as ceramic burrs, however. Ceramic burrs are the material that many manual espresso makers feature. They're durable and operate efficiently for grinding coffee beans. The next step in the decision-making process is to choose between an auto and manual grinder. With a manual machine, you're the driving force behind the grinding process. The system uses a swivel arm to rotate and grind the beans. A coarse grind doesn't take much effort. But, to finely grind the beans, it can take quite some time with these machines. An automatic coffee grinder does the heavy lifting. Owners push a button, choose the setting, and set a timer. There's no guesswork and no mysteries behind it. The main drawback is the higher price of an automatic grinder. We reviewed several of the best coffee grinder systems available. In our process, we considered blade and burr grinders. We discussed areas including the precision, quality, grind speeds, and usability. We examined the consistency of the grind from one bean to another. Our review also focuses on the features each machine possesses. Things like timers, adjustment settings, power levels, and the option to choose between different bean textures. We included customer reviews, feedback, and products in different price brackets. 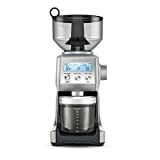 This information serves to help consumers find the best coffee grinder, for personal use at home. The price of the best coffee grinders varies significantly between the type of grinding mechanisms the machine uses. Whether it's a manual or automatic system causes a significant difference in pricing. On average, consumers can expect to pay $40 to $300 for higher-end models. When choosing a coffee grinder, consumers should consider both blade and burr machines. Depending on the consistency each coffee drinker prefers, the device they'll select will vary. These are a few of the best coffee grinder varieties, in both categories. For those who prefer pushing a button and letting it do the work, consider buying a blade coffee grinder. And, for those who want to find a more affordable product, this is the category to shop in. These are a few of the best blade grinders available. Clear Top Cover and One-Touch Control allows for operation at the touch of a button-simply push down on the cover to begin grinding and release to stop. The clear cover also allows you to easily see the consistency of grinds. The system has a clear-tap cover and uses one-touch control, for quick and easy grinding at home. By pushing down on the cover, the machine automatically begins grinding the coffee beans. With the transparent cover, owners can also easily see the grind consistency of the beans. The stainless steel blade is powerful and efficient. Additionally, it grinds enough beans for a 12-ounce cup of coffee, in a matter of minutes. The removable, 4-ounce stainless steel bowl, has measuring marks on the side. This design indicates how many ounces are necessary when grinding coffee beans. In this review, the customer claims the product quality is inferior. In only six months, the coffee grinder did not work any longer. The average ratings are 3.9 out of 5 stars on Amazon. The 250-watt electric grinder uses a one-button operation to grind coffee beans. Additionally, it grinds herbs and spices in the conical shape system. 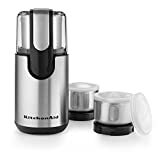 It has a stainless steel blade and a removable 2.5-ounce grinding cup. Owners can easily see through the clear-top finish. The system operates with a one-touch pulse operation. Therefore, to achieve the best grind consistency, it is best to hold the button for one to three seconds. Doing this also allows owners to choose the perfect grind consistency for the coffee beans. The machine's quality isn't the best. Specifically, the motor isn't as powerful as other coffee grinders. In this review, the customer indicates the product broke after only two months of use in their home. The customer rating is 4.4 out of 5 stars on Amazon. This system has an 18-ounce capacity. It allows owners to grind directly into a portafilter, paper, or filter cups. It features timer settings, allowing you to set increments as little as 0.2 seconds when grinding coffee beans. A bright LCD screen allows people to adjust the timer and grind settings to achieve the perfect consistency. The motor's design helps preserve the natural aroma of coffee beans. Additionally, it functions to minimize the potential of burning out, so coffee beans always taste fresh. Some reviewers also complain that the motor burns out after several years of use. In this review, the customer notes it doesn't grind the beans coarsely enough. So, they can't enjoy the coffee at the consistency they want to. Customers rate it 4.3 out of 5 stars on Amazon. 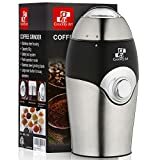 [Upgraded] Coffee Grinder Electric - Small & Compact Simple Touch Blade Mill - Automatic Grinding Tool Appliance for Whole Coffee Beans, Spices, Herbs, Pepper, Salt & Nuts - Great Coffee Gift Idea! The one-touch system rapidly grinds coffee beans in a matter of seconds. In under 20 seconds, it'll grind beans to the perfect consistency, for a great tasting cup of coffee. The machine is easy to clean and has a built-in safety setting. It only operates when the blade is shut off, and won't come into contact with fingers. It can also grind nuts, herbs, and other items with a multi-blade operation. The customer complains that the product isn't a "multi" purpose grinder. The manufacturer states it can grind coffee, and other herbs and nuts. In this review, the customer indicates it isn't great for non-coffee items. Customers rate it 4.5 out of 5 stars on Amazon. Those who love the rich aroma of coffee will prefer a burr coffee grinder. These are a few of the best products to choose from when comparing the best coffee grinder. With a small footprint, the convenient, front-mounted system has pulse buttons and an on-off switch. It also has over 40 grind settings owners can select. Settings are ranging from espresso to drip, and manual brewing options. The system is made in Europe, using only the highest quality parts and finishes. The bean hopper is eight ounces, and the ground capacity bin is five ounces. The weight of the grinder is only seven pounds, and it barely takes any counter space in the kitchen. A powerful, high-torque, DC motor does the heavy lifting in this automatic coffee grinder. One reviewer indicates the quality of the coffee grinder is excellent. However, it does leave behind a mess, which makes it difficult to clean up after use. It has a rating of 3.8 out of 5 stars on Amazon. The OXO grinder has 40 mm durable, stainless steel blades for grinding coffee beans in seconds. There are 15 settings, and a pulse option owners can use as well. There are also micro setting adjustments, for coarser or finer grinding needs. A one-touch start is easy to operate. The large hopper can hold up to 0.75 pounds of coffee beans. The ground container is large enough to brew a 12-ounce cup of coffee in. One reviewer states it does an excellent job at grinding the beans it does capture. But, it does leave a few stray beans behind when grinding. The price of this item is $90 to $120. Customers rate it 4.3 out of 5 stars on Amazon. A brushed-silver, stainless steel motor is robust and durable. The machine features commercial grade grinding power, in a compact system. The bean holder can hold up to 8.8 ounces of beans at a time. The tight-fitting container holds up to four ounces of ground coffee beans. There are four grinding categories to choose from including an extra fine, fine, regular, and coarse setting. Most important, it allows owners to modify settings for different specialty drinks they want to make with the beans. Several reviewers note that this product breaks down often. Therefore, it's not the best regarding material quality and design. In one review, the customer states it took four months before it froze, and wouldn't start back up. It rates 4.0 out of 5 stars on Amazon. This coffee grinder has a continuously adjustable grind function. It crushes whole beans in the stainless steel conical burr, in a matter of seconds. There are a total of 14 settings from coarse to fine. There are settings for espresso, French Press, and other specialty coffee beverages that aficionados will appreciate. There's a preset time for grinding. Additionally, the lid helps to preserve beans to maintain freshness and taste. Several reviews indicate quality and poor material concerns in this coffee maker. This reviewer states there's a plastic part between the motor and burr. So, this diminishes the overall quality of the system. The average ratings are 3.6 out of 5 stars on Amazon. When comparing the best coffee grinder systems, homeowners should compare several models. Some prefer blade, while others will choose a burr coffee grinder. 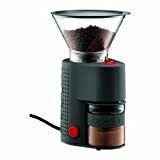 Whichever your priority is, there are several great products to choose from when buying the best coffee grinder. The best blade system is the Breville BCG820BSXXL coffee grinder. The automatic grinder has a brushed stainless steel motor. The motor's design helps to preserve the essential aroma of the coffee beans. It also helps minimize overheating of the engine. There are 60 precise grind setting options, and owners can adjust grind times quickly. The system features an 18-ounce bean capacity and clear hopper. This system allows owners to see through and choose the perfect grind consistency. It also will enable owners to grind directly into filter baskets, paper filters, or portafilters. Consistency, quality, and a great design make this the best coffee grinder in the blade category. For those who prefer a burr grinder, the OXO grinder is a great option. Although it does miss a few beans, the grinding power is phenomenal. It has a reasonably large bean capacity and multiple grind settings. The powerful blades work quickly. There are also micro settings and a pulse function. This design allows owners to modify settings easily. It is affordable, easy to use, and compact. For the price, consumers can't find many options that are better, from a reputable manufacturer. Of course, no two consumers are alike. Therefore, comparing burr and blade coffee grinders is an excellent way to narrow down the search. These are the best options when choosing the best coffee grinder. Previous articleIs This Braun Coffee Grinder the Key to the Ultimate Cup?